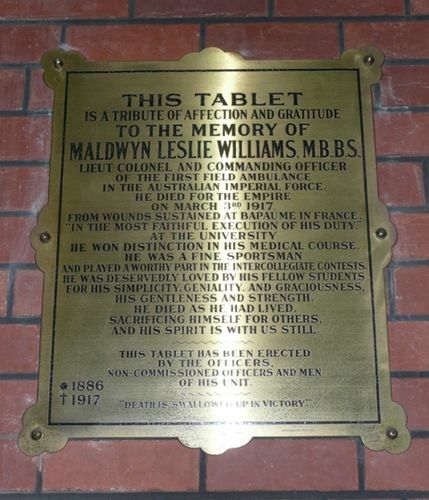 The tablet commemorates Lieutenant Colonel Maldwyn Williams, the commanding officer of the 1st Field Ambulance, who died of his wounds he received at Bapaume in France during World War One. Lieut-Colonel and Commanding Officer of the First Field Ambulance in the Australian Imperial Force. He died for the Empire on March 3rd 1917, from wounds sustained at Bapaume in France. "In the most faithful execution of his duty." At the University he won distinction in his medical course. He was a fine sportsman and played a worthy part in the Intercollegiate contests. He was deservedly loved by his fellow students for his simplicity, geniality, and graciousness, his gentleness and strength. He died as he had lived, sacrificing himself for others, and his spirit is with us still. This tablet has been erected by the Officers, Non-Commissioned Officers and men of his unit.